When most people hear "salt" they immediately think of the little, glass shaker containing the white crystals we all know so well as table salt. We have all experienced the saltiness of a pretzel thanks to our 10,000 taste buds and the receptors that register salty, sweet, bitter, and sour. But, where do we find salt? And what are the different types of salt? There are two main sources of salt; sea water and rock salt (halite). Rock salt is formed in beds of minerals that are the result of bodies of water drying up. These salt beds are found in vast areas around the globe and salt can be extracted from these beds either by mining or solution mining using water. Solution mining causes the salt to reach the surface as brine and through evaporation salt crystals are collected. This process is similar to your bodyʼs own process of prespiration. I am sure many of you have noticed the thin, white, caked on layer of salt on your skin after a long run or a hard game of football. As I mentioned previously, salt is found all over the world. In North America alone there is the Great Salt Lake in Utah, a large salt bed that extends from the Appalachian basin in Western New York through parts of Ontario and under much of the Michigan basin. Furthermore, you can find salt deposits in Texas, Kansas, Ohio, New Mexico, Nova Scotia, Saskatchewan, and along the coasts where salt is collected from sea water. There are few areas in North America that are not touched in some way by salt. Salt is everywhere from our skin to the ocean, but did you know that there are more types and varieties of salt than just plan old table salt?! Table salt since it is the most common is where we will begin. Table salt is mined using solution mining from salt deposits and creating a brine. This salt variety has the most minerals removed and usually has iodine added to make iodized salt. The reason salt became iodized was so that we could get this important element into our diet. Iodine, to be brief, is needed to produce two hormones, which help regulate our energy and metabolism. If a person become deficient in iodine, their thyroid gland will swell into what we call a goiter. Due to the risk of people being deficient and many areas not having a source of iodine in the diet, salt companies began iodizing salt to remedy the deficiency. Once the salt is harvested by the above solution mining method, different varieties are produced. Some of the common cousins to table salt are; pickling salt, canning salt, coarse salt, pretzel salt, rock salt, popcorn salt, and seasoned salt. Essentially they are all the same as table salt in mineral content, but vary in size and may have flavorings added. Next we have kosher salt or koshering salt. This salt is produced by solution mining and creating a brine like table salt, however, the brine is continually raked during the evaporation process. Kosher salt does not contain any additives and it is a coarse-grain. This salt was developed for the preparation of kosher meats in accordance with Jewish dietary laws. The salt itself is not kosher, however, during the raking process to create kosher salt, blocks of salt are produced which help to draw blood out of meats. The taste of kosher salt is lighter then table salt. Due to this it is preferred by many chefʼs over table salt for cooking since it dissolves fast and has a more even taste. As an aside - if you decide to cook with this salt, make sure to add more then the recommendation in the recipe since most recipes call for table salt. Lite salt and salt substitutes are less commonly found since they are not as tasty as salt. These are created by using potassium chloride instead of sodium chloride. These substitutes are generally used by people who have a medical reason to avoid sodium. 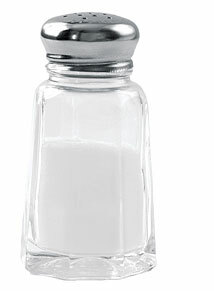 Sour salt is another less common salt and in fact it is not a salt at all. The only thing salty about sour salt is the name. Sour salt is actually citric acid and is used to prevent browning of fruit. Another option is to use lemon juice. The next time you slice your apples for school and donʼt want them to be brown for lunch just add a splash of lemon juice and you will have nice white apple slices! Now on to the lengthy and my personal favorite type of salt... Sea Salt! And as you have already guessed it is produced from ocean water and not through mining. The sea salts are extra special since they contain minerals not found in the mined salts. The process of evaporating sea water to collect the salt is a bit more expensive then the mining process so you will have to pay a touch more for this yummy salt, but the health benefits are worth it. Due to the various locations to collect sea salt and the variety of minerals in these different areas there are loads of different types of sea salt. Below I have listed a few and you will notice that all of these salts are colored. The color is due to the minerals and elements found naturally in salt and various based on region. These salts are nutrient dense, white salt, like white sugar has been refined and processed to give it a white color that we are so used to, however, this also means the nutrients have been striped from product. Black salt, Kala Namak, Sanchal - this salt is from India, has a pink-grey color, and has a strong sulfur odor. Grey salt, Celtic salt, Sel Gris- this salt is from France and is harvested from the light film of salt that forms during evaporation and has a light purple - grey color. It is named from the traditional method of Celtic hand harvesting. Hawaiian sea salt - is produced by evaporating sea water and has a pink color from the volcanic red clay (Alaea) that is added to it, which has a high iron oxide content or a black color if activated charcoal is added to the salt. Himalayan salt- salt mined from the Himalayas is pure and typically free of toxins and pollutants that are found in many other areas of the world. Himalayan salt contains 84 minerals and elements that help give the salt its beautiful pink color. Salt mined from the Himalayas can be millions of years old since it is found deep under the earth. This salt is considered "raw" since it has been unrefined, unprocessed, and hand-mined from salt caves that were formed when the ocean receded millions of years ago. Fleur de Sel- this salt is skimmed from the tops of salt ponds in the early evaporation process. The flavor varies based on the region where it is produced in either France or Portugal. Italian Sea salt- harvested in the Mediterranean sea by hand and natural evaporation. This salt has a high concentration of iodine, fluorine, magnesium, and potassium. Next time you have a chance to look down the baking aisle in the grocery store make sure to look at the various types of salt and see what different colors and varieties you are able to find. The different colors represent different mineral content and all have various uses in cooking and baking. Pick up your favorite color of salt and use it in your next cooking session in place of traditional table salt and see if you notice any difference and you will be enjoying some extra minerals in your diet. Here is a recipe you can make that is a traditional Bolivian dish! At the bottom of a large pot, put corn husks (more or less three inches high), and add boiling water until covering them. Place the pot over high heat. As soon as the water boils, add the corn and the Lima beans separated by corn husks. Let it boil for twenty-five minutes more or less. Add the washed potatoes and cover with more corn husks. Let it boil for another twenty minutes, or until all vegetables are cooked. In a large pan heat oil over high heat. Fry cheese slices until golden. Do not let them burn. In each plate, serve one corn on the cob, Lima beans, one potato and slices of fried cheese. Add llajwa is desired. Before enjoying sprinkle with your newly purchased sea salt and see how the flavor is enhanced!